The Arizona Cardinals brought their season record to .500 with a 26-24 victory over the Seattle Seahawks. QB Drew Stanton got the call in this game and went 15-of-34 for 145 yards, one touchdown, and one interception. RB Kerwynn Williams carried the ball 23 times for 75 yards, but RB Elijhaa Penny cashed the only rushing score of the game for either team. WR Larry Fitzgerald led both teams in receptions with eight. QB Russell Wilson was 18-of-29 for 221 yards and two touchdowns, both of which went to WR Doug Baldwin, who had four catches for 90 yards overall. The second touchdown connection briefly put the Seahawks in the lead in the fourth quarter. However, K Phil Dawson gave the Cardinals the lead back with 2:21 left in the game. The Seahawks drove 45 yards to give K Blair Walsh an opportunity to win the game, but his attempt sailed wide. 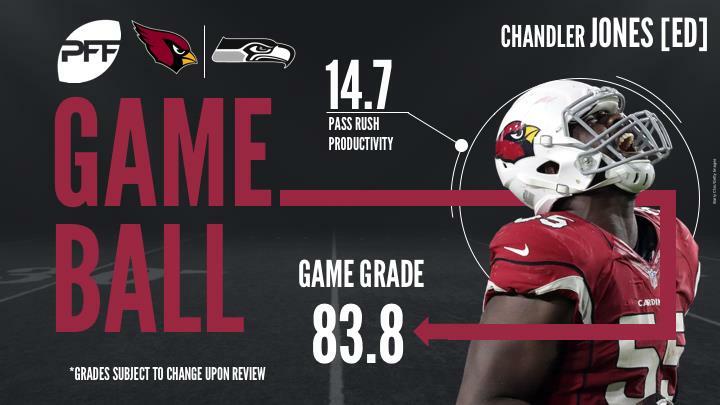 With that, we give you our PFF-exclusive takeaways from the contest for each team. Fitzgerald always gets more asked of him as a blocker than just about any wide receiver in the league, and he had a couple nice blocks against Seattle. As a receiver, he had a game-high eight catches for 55 yards. Williams averaged just 3.2 yards per carry, but nearly 75 percent of his rushing yards came after first contact and he forced four missed tackles. While he’s clearly not David Johnson, he’s proven over these last five weeks as a starter that he can contribute as a role player. Jones sacked the quarterback two more times this week, giving him a career-high 17 sacks on the season. He added four hurries as well, for a total of six pressures in the game. Jones finished the season fifth among edge defenders in total pressures (75) and and ninth in total run stops (26). Pierre had the best game of his career, largely playing as a pass-rusher. He had two sacks and one hit and a batted passwhile rushing the quarterback. He added a run stop in just five snaps against the run as well. In a game where the Seattle offense generally struggled for much of the game, Baldwin caught four of five targets and notched his first multi-touchdown game of the season. Baldwin ended up just nine yards shy of his third-straight 1,000 yard season. Seattle put Graham in a tough position by asking a lot of him as a blocker in the run game, which is largely why he graded so low. He had three catches for 45 yards, including two first downs. Over the final four games of the season, he had just five catches for 47 yards, one touchdown, en route to his lowest yardage total since his rookie season. Graham did have double-digit touchdowns for the fourth season of his career, however. Maxwell was targeted seven times on the night, allowing just one 11-yard catch to Larry Fitzgerald. Otherwise, he was continuously in close coverage and notched two pass breakups. He also made two tackles for stops in run defense. Jordan made a sizable impact on limited playing time. He rushed the quarterback 17 times, tallying two hurries, a hit, and a strip-sack. Jordan also made two runs stops on 13 plays defending the run. Despite playing just 135 snaps this season (the lowest total of any season he’s played in) he had a career high in sacks and defensive stops.